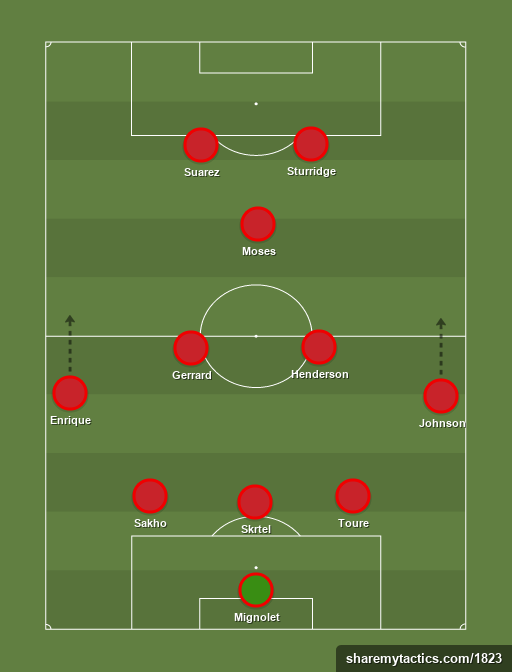 First choice right-back Glen Johnson will return to the starting lineup today, meaning Brendan Rodgers has a straight choice between Lucas and Jordan Henderson to partner Steven Gerrard in central midfield. Henderson’s man of the match performance against Crystal Palace last time out should mean he keeps his place, while Daniel Agger will have to patiently wait from the bench, with the Toure, Skrtel and Sakho in excellent form. Coutinho has not fully recovered from his shoulder injury, meaning Victor Moses will continue to deputise in the no.10 position – behind the goal-scoring duo of Daniel Sturridge and Luis Suarez.